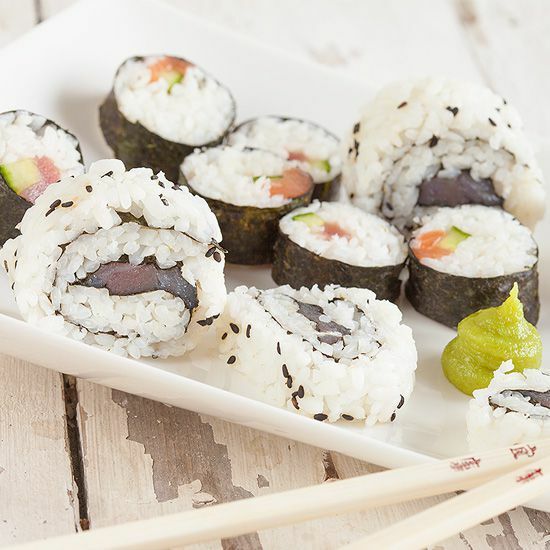 Sushi restaurants are amazing, but you can easily make your own maki sushi! Give it a try, it's easy and worth the effort every bite. First you have to make the rice, sticky sushi rice. RINSE the rice with cold water until the water is clear. ADD sushi rice with 2 cups of water to a medium-sized pan. Bring to a boil and then turn down the heat as low as possible and cover with a lid. Don’t stir in the pan, let it covered for 15 minutes. Turn the heat off, drain the rice and let it stand for another 10 minutes, this way the steam will make it even more sticky. And that’s the way we like it! COMBINE the rice vinegar, lime zest, lime juice and pepper and stir it into the rice until all of the rice is coated nicely. 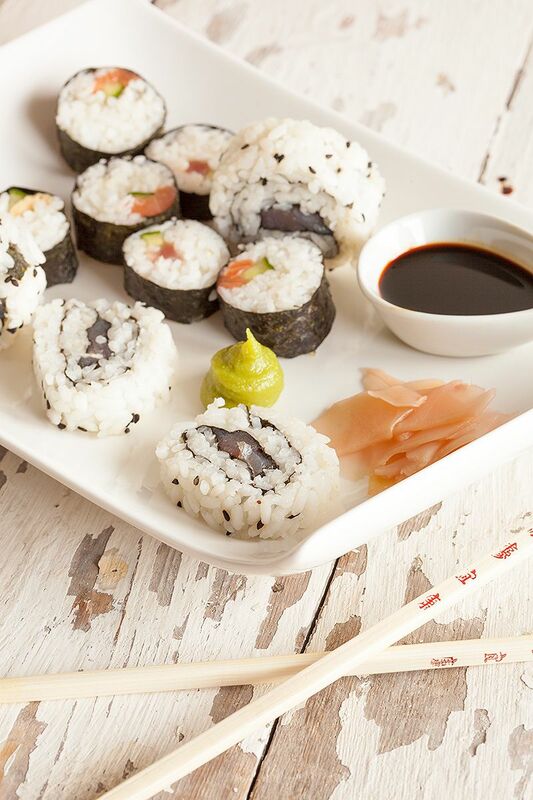 TRANSFER the sushi rice to an oven dish, this way it will easily cool off. Meanwhile prepare the omelette and let it cool off. Then grab the cucumber, salmon, tuna, omelette and/or shrimps. Or any other fish you like. CUT all of it in strips, the strips should fit the length of the nori sheet. 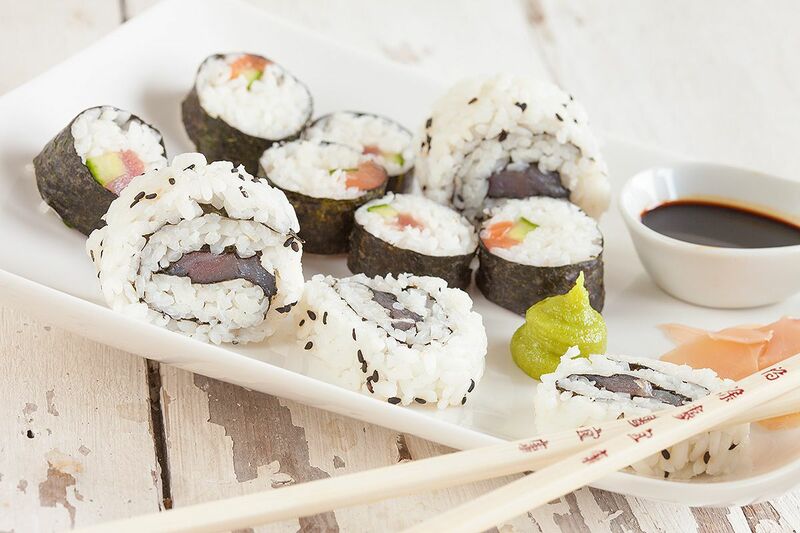 GRAB your sushi mat and place a nori sheet on top, shiny side down. The rice should be sticky, so it’s recommended to wet your hands with water first. Then grab about 3/4 cup rice and press it downwards on the nori sheet, leaving a blank space about 1/2-inch thick on the bottom. In the middle of the rice, place some cucumber and salmon, tuna or omelette. Lift the sushi mat and hold the filling in place with your fingers. ROLL the sushi mat so the rice will touch and the filling holds it place. Gently press and roll, wet the edge of the nori sheet with water to close the sushi roll. Repeat for all of the nori sheets and sushi rice and cut them into pieces. You can also make a sushi roll inside out. For this, wrap the sushi mat with cling film. Place a nori sheet on the mat, divide a thin layer of sushi rice over the whole nori sheet instead of just one line as we did with the maki sushi. You can add some black sesame seeds to the rice now. Now flip over the nori sheet, so the rice will be pointing downwards. 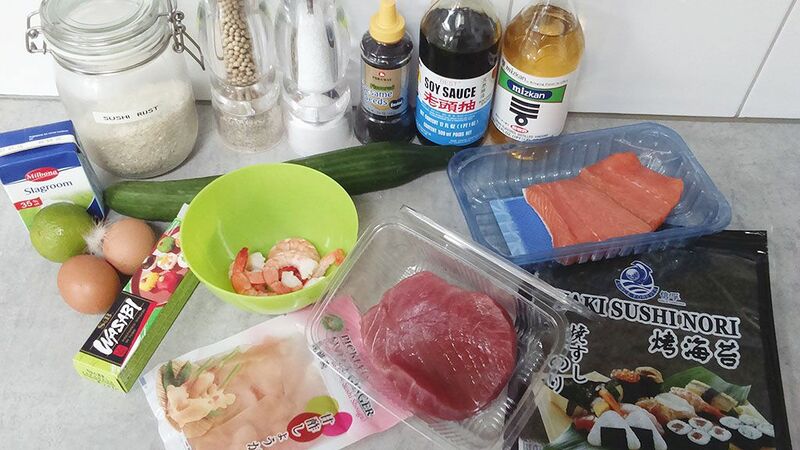 PLACE some fish and cucumber on the nori sheet, roll the same way as you did with the maki sushi and cover with cling film so the rice will stay in place. CUT the inside out sushi with the cling film still on, remove after cutting. SERVE with wasabi paste, pickled ginger and soy sauce. I’ve been making sushi for years … not hard at all, just a lot of work for all the prep. :) Love your raw tuna. Is that ahi tuna?